Situated on the Waterfront, Bordeaux Quay seems to be in a bit of an odd location, surrounded by the chain bars that make up its neighbours. It’s a bit of a Bristol institution when it comes to food and drink, though: restaurant, brasserie, bar, bakery, cocktail venue, cookery school, deli…you name it, BQ undoubtably do it. Their website boasts a number of national and local awards, so I was understandably quite exciting to be paying them my first visit. The brief respite in the bad weather meant that we were actually able to sit in the covered outdoor dining area – it’s a great location for people watching and for seeing all of the activity as boat owners (and their dogs!) head backwards and forwards to their vessels. 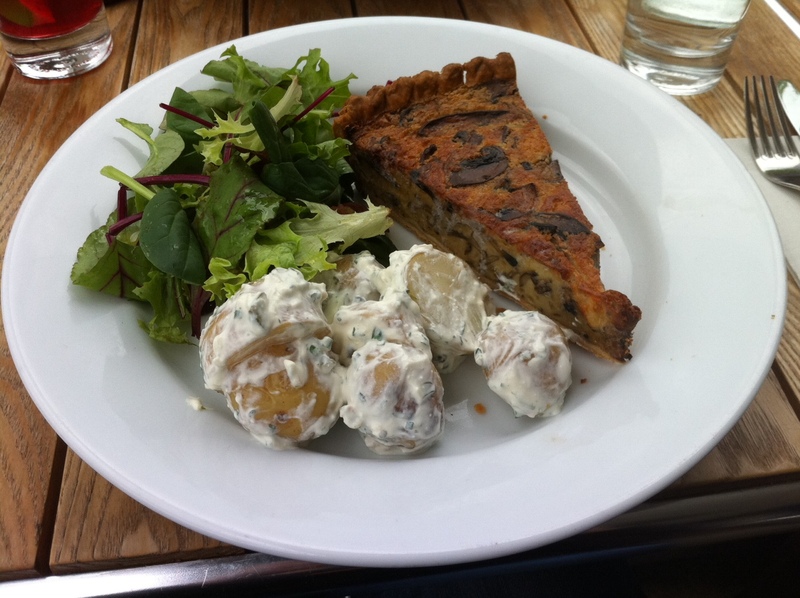 It was good to see a few different options on there for vegetarians (of which we had one in our party), and it was actually a veggie option that I chose in the form of a mushroom, Gorgonzola and white onion tart, served with a potato salad and mixed leaves (£9.50). A summery-yet-hearty dish, it was attractively presented and the generosity with the mushrooms was evident even before digging my fork in for the first time. I’d have described it as more of a quiche than a tart in terms of consistency, but it was delicious. While the flavour of the Gorgonzola was evident, it didn’t overpower the mushrooms, and the potato salad fresh and light. My one complaint would be that the pastry was quite thick, which detracted a little from the flavours of the tart’s filling. The boys both went for the burger (£10.50), quickly demolished, and one of our party ordered the herb-crusted roast cod (£13), which apparently did taste as good as it smelt. The remaining two diners chose the beetroot risotto with goats’ cheese, walnuts and rocket (£8), vibrantly coloured and raved about. A side order of chips for the table (£2.75) wasn’t really needed, but the thick-cut potatoes set down in front of us were so crisp on the outside and fluffy in the middle that we had no trouble, between us, working our way through the entire bowl. Service was friendly and attentive throughout, and our charming waitress had judged the mood of the table well, joining in appropriately with the banter when we were ordering. I’d definitely be keen to head back and try their restaurant menu, or attend one of their regular themed supper evenings that they hold throughout the year. An enjoyable venue for a relaxed yet delicious meal. 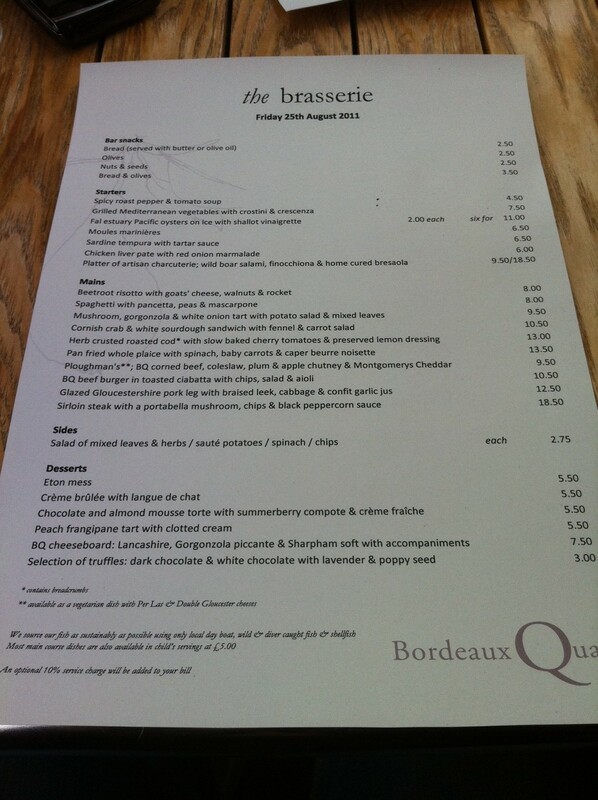 I love Bordeaux Quay, always have great food there and their cookery courses are absolutely fabulous!